This is the summary of an #ELTchat which took place on 23 November 2016. It is the first summary I have contributed for over two years. It was moderated, expertly as always, by @Marisa_C, @SueAnnan and @angelos_bollas. The full topic wording, proposed by current IATEFL president, Marjorie Rosenberg (@MarjorieRosenbe), was ‘How can we discuss diversity, inclusivity and social justice in the classroom in times as these? Marjorie shared many examples of reasons for the topic proposal with me outside of the chat: Brexit (the UK’s vote to leave the EU), the refugee crisis in Europe, the election of Donald Trump in the US, general division in the UK and US, and the rise of far-right groups, especially in Austria, where she is based. Her family has a strong background in public service. Her cousin is in the Obama administration and his wife founded a charity in Washington for underprivileged teenagers. Her mother volunteered for years for several casues and this is one of the reasons she originally got involved in IATEFL – in order to give something back. Marjorie also highlighted a forthcoming plenary by JJ Wilson at the next IATEFL conference in Glasgow 2017 on this very topic. @SueAnnan led the discussion by stating that she teaches diversity in her Business English class. Both @angelos_bollas and myself (@teacherphili) stated that it was not something they explicitly taught and asked how Sue includes this in BE classes? She replied that she does scenarios for employment roles. We discuss black, women, different religious, disabled and LGBTQ applicants and such like, she stated. It gets the class started. She suggested that dealing with diversity actually meant discussing inclusivity at the same time. She stated that her classes are always mixed, [so] tolerance is an absolute must. She later added that she has been discussing the recent cryogenics case in the UK. She had a class of doctors who were dead against it. @fionaljp felt diversity is, maybe, more about what you do. @GlynsHanson agreed before adding that it depends on age of the students too. She didn’t assume that she knew more on these subjects than her mainly adult students. Except for preparing TOEFL etc, her students chose the subjects – almost never the ‘hot’ subjects. She added that she hadn’t had enough time for discussing the ‘big’ questions [of social justice]. @MarjorieRosenbe stated she had her students talk about things important to them. We had lots of refugees here in Austria, for example. She covered these topics by talking about traditions, holidays, etc. My students opened up a lot and explained personal things. @Chris_Myth said it can be hard. He sometimes get students with prejudiced views. ‘Do I argue with them for the sake of challenging prejudice’, he asked, ‘or do I take a teacher role where the teacher is not an authoritarian figure and students can speak without fear?’. @Angelos Bollas answered that it is very important for teachers to model what freedom of speech is – the teacher should monitor though and deal with sensitive issues. @Chris_Myth agreed and added that ‘if a student is being sexist/racist, then that could upset others, which shouldn’t be allowed to pass.’ Phil Bird (@pysproblem81) asked, that in some contexts, wouldn’t it be a legal requirement to challenge it? @Chris_Myth said that in the UK it is now a legal requirement to report potential terrorist sympathies. Whatever that means. @Angelos Bollas said that ‘also the opposite [applies] … some countries/institutions would not allow any discussions on these topics – sad. I think it boils down to what each thinks important: doing as said or what one thinks is right,’ he added. Fortunately, for @Chris_Myth, whenever this [prejudice] has happened, usually sexism, other students have argued against the prejudice. If a student is being sexist/racist, then that could upset others, which shouldn’t be allowed to pass. @TesolMatthew emphasised that, in his opinion, diversity, inclusivity and social justice are ON THE TABLE in all classrooms. @Marisa_C agreed with this but, playing devil’s advocate, said that some teachers think it is not their job to take care of such issues. Maybe it’s more about promoting, offered @fionaljp. @GlenysHanson tried to stoke a political fire by saying that she adored playing devil’s advocate, offering the suggestion that ‘I voted for Trump because of his hairstyle’. Something that neither @SueAnnan nor @angelos_bollas could manage to say, even on a good day. A role play with Trump, however, would be fab, according to @Marisa_C. @MarjorieRosenbe pointed out that, in respect of the US election, TESOL has a statement about it on their website. It could be discussed with students or trainees. @SueAnnan thought that IATEFL did something similar. However, IATEFL is not an advocacy organisation the way that TESOL is, added Marjorie. We wrote to members after BREXIT about our goals. Marjorie also referred participants (trainees) to the recent joint IATEFL-TESOL web conference where ‘we walked the talk’. @Marisa_C proposed that some people think modelling these behaviours is better than preaching and asked if the participants agreed. Does this work with all kinds of contexts? To which @angelos_bollas answered ‘Absolutely. [It’s] still important to highlight them in class, isn’t it? Especially now? Given [the election of] Trump and extreme right wing parties.’ @fionaljp thought it was good to include authentic material -news items for sure. To which Angelos replied that it opens up some room for learners to express their ideas re current events. @Marisa_C later added that she thinks tolerance, justice, empathy, inclusion are won with knowledge, not the lack of it. To which, @MarjorieRosenbe agreed totally. Marisa added that she was inspired to do this by one idea Mario Rinvolucri used to do – called absent observations. In which one teacher taught the lesson but a DIFFerent teacher took and answered feedback on this lesson. She thought it was crazy at first but it really works in a TP group. @Chris_Myth believed that ELT materials were very good for some diversity issues but not for LGTB inclusivity. @angelos_bollas said that there are no LGBTW (sic) references in global coursebooks – only in Germany. Chris responded that it is our duty, therefore, to talk about LGBTW issues in class or use texts with people from those backgrounds, or to make additional material, according to @SueAnnan. Angelos replied that we should push publishers to start including all people equally. @TesolMatthew said all of these, and confessed that he had teared up at the sight of Ellen DeGeneres receiving a medal of honor. @MarjorieRosenbe said that advanced students can talk about news they hear or read and give opinions. They have to stay polite to all. @Chris_Myth concurred, but at lower levels it is easy to miss the mark from a lack of language and say bigoted sounding things. Sadeqa Ghazal (@sadeqaghazal) asked how do we handle it if a text in a coursebook is biased? Both @fionaljp and @Chris_Myth said ‘don’t use it’, but, unfortunately for her there is no choice. @Chris_Myth added that you can get students to notice it as a critical thinking exercise. @MarjorieRosenbe stated that she likes the idea of this. Her Austrian students learned so much about different cultures from the others, it was eye-opening, she added. @sadeqaghazal also asked if any of [the participants] teach classes where all the students are of the same community or background? To which @angelos_bollas replied that he used to. What can be some of the ways to make these students aware of a diverse world? asked @sadeqaghazal. I used – a) role play, b) reading or watching about different cultures, followed by c) discussions among the students. Angelos replied that role-plays are always good for that matter. @MarjorieRosenbe commented that role plays with students taking opposite opinion from what they really believe can build tolerance. @GlenysHanson thought that Jesuits invented arguing for what one doesn’t believe. She was not sure that their aim was to build tolerance, however. 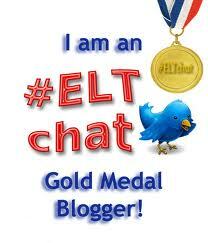 This was a very interesting and topical #ELTchat, which demanded opinions. As Wilson’s plenary next year will seemingly argue – teaching is never neutral. Teachers advocate certain values. These values depend on one’s beliefs, conception of education and the teacher’s role. Some believe that all teachers should use their creativity and passion to bring about social change. I hope I have done this chat (ahem!) justice. As I often find with these kinds of summaries there is a risk of decoupling – that is taking a reply out of context or to dissociate it from the original question asked. Please add a comment if you think this is the case or if you have been misquoted and want to clarify what you said. OK, Marjorie. Thanks. I must have missed this. The link has now been added at the end. Thank you for such a great summary! I am running an eTwinning Inclusive Education group and this is one of the topic we would like to handle as many refugees have arrived EU recently. Can I share the blog in my group and on the twitter using #etwinedu hashtag? Of course, Marijana. This topic sounds very relevant to your e-twinning group. I have not previously heard of that particular social media platform. Thanks for stopping by to read the summary. Phil. Thanks for the thoughtful summary.